In January 1998, Editor & Publisher, the preeminent media trade magazine, conducted a poll of 167 newspaper editors across the country. Investor's Business Daily reporter Matthew Robinson obtained complete poll results, highlights of which were featured in the MRC's February 1998 edition of MediaWatch. When asked 'How often do journalists' opinions influence coverage?' a solid majority of the editors (57 percent) conceded it 'sometimes' happens while another 14 percent said opinions 'often' influence news coverage. 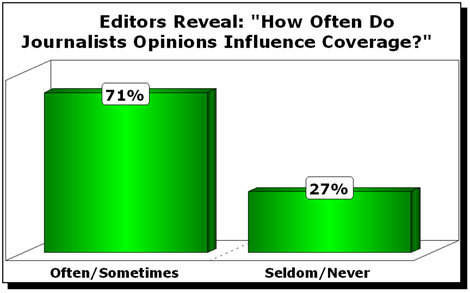 In contrast, only one percent claim it 'never' happens, and 26 percent say personal views 'seldom' influence coverage. Next: Exhibit 1-12: The People and the Press: Whose Views Shape the News?